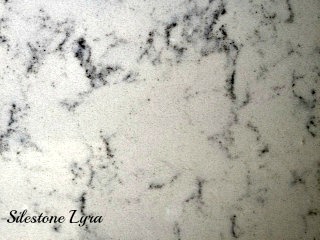 We have been working on the kitchen. 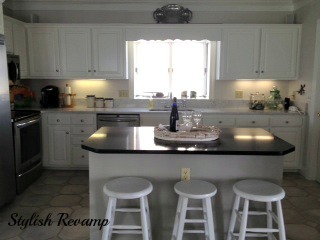 When we first went to view the home, the kitchen had formica counter tops and pickled oak cabinets. 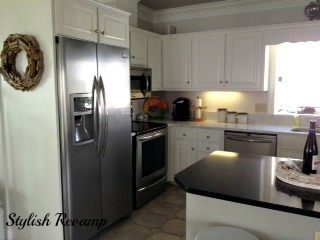 It was very well maintained but just seemed so outdated to me and I couldn’t wait to get started on the kitchen revamp. Here is what we have done so far. 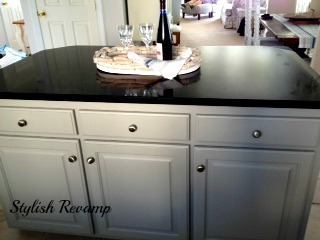 The island is done in Silestone Tao. I liked the contrast between the main counetertops and the island. 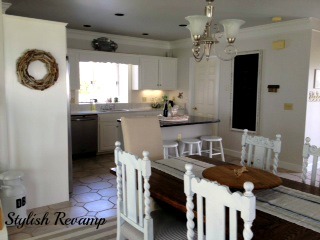 We would still like to add a subway tile backsplash and I need to add some accent pieces. So far I am very, very happy with the way it has turned out. This is what it looked like when we went to view the home (I got the photos from the real estate brochure). And I love it…It is one of my most favorite places to be and I am always sad when it is time to leave! Love it! What a difference! I like the different top for the island, Good idea. holy moly!!!! what a difference! 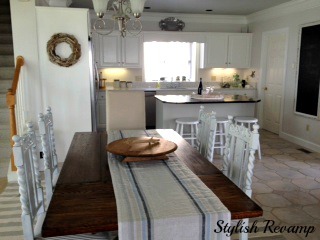 those chairs are STUNNING and love the table, too! 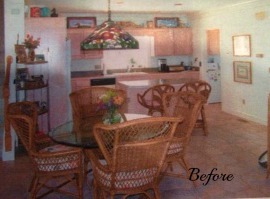 wow that kitchen has come a long way! Thank you for stopping by and checking out our kitchen! Well done. It is stunning. Understood! This looks fabulous! I had to redo our very, very outdated country kitchen too when we got this house. Took me 2 1/2 years, but I’m loving it now! I hope you love yours just as much! We are…thanks for stopping by. I will be adding more photos once I add the finishing touches. WOW, your kitchen is beautiful!! Thanks for taking the time and stopping by to check us out! I appreciate it. 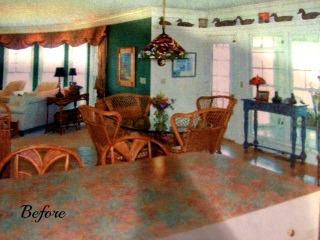 I love before and afters and your kitchen looks greate. It’s very clean looking with all the white. Thank you. I do want to add a bit more color with the accessories. Thanks for stopping by. Wow! What a beautiful transformation! Great job!